Partner sites on the Yandex Advertising Network can display targeted ads suited to the individual interests of each user. The individual interests of users are determined by their behavior when using Yandex services or their behavior on partner sites. This method for ad delivery helps prevent users from seeing ads that they have no interest in whatsoever. We also consider possible declines in interest toward certain themes by distinguishing user interests as permanent or temporary: when preferences change, so do ads. Note. Yandex will never apply this ad delivery approach if the ad concerns personal matters (for example, singles ads, medical ads, etc.). Exceptions are: sunglasses, baby thermometers, blood pressure monitors, first aid kits, warming pads, thermometers, heart rate monitors, immune response modifiers, anti-inflammatory agents, antipyrexials, painkillers, antitussives, antiallergic, antimicrobial, and antiviral medicines (see Yandex.Direct Help for more information). 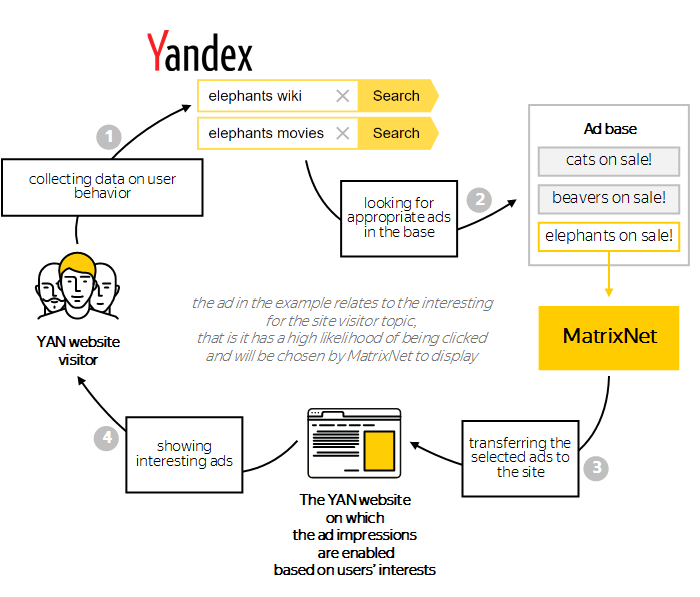 Yandex began using behavioral targeting advertising in 2008. At that time, only one factor was considered when serving ads - the user's recent search history. Now we employ 8 different types of targeting based on information about users of our partner sites, and we are making continual developments in this area. Behavioral targeting is most effective for sites containing a broad range of themes and whose target audience is difficult to clearly distinguish based on page context. Adding behavioral targeting to contextual targeting helps substantially increase the size of the target audience to which we can offer advertisers access. Available statistics show that, for the majority of ad platforms, the Click-Through-Rate (CTR) of ads served based on user interests is higher than the CTR of content-based ads. To find out how effective behavioral targeting is for your ad platform, run an experiment. Special (link in Russian) are installed on user computers in order to determine their interests. All data processed by Yandex is protected by our Non-disclosure agreement and may not be disclosed to third parties. If for any reason a user does not want his or her personal interests to affect ad delivery, he or she can opt out of preference-based ad delivery. You can always enable or disable impressions targeted at individual user interests for all blocks on a specific content site yourself.